Below the Great War Memorial is fixed a small matching marble plaque commemorating the six men who died in the Second World War. Electrician Sidney Joseph Cartwright of the Royal Navy, HMS Indefatigable. Son of Thomas W. and Sarah Jane Cartwright, of Tulip Cottage, Burlescombe. Born in the June Quarter of 1882 in Rotherham. Died 31 May 1916 aged 34. Stoker 2nd Class Alfred John Clapp of the Royal Navy, HMS Marlborough. Son of Henry and Mary H. Clapp, of Allen Cottage, Westleigh. Born in the June Quarter of 1895 in Westleigh. Died 31 December 1914 aged 19. Second Lieutenant William Francis George Perham of the 3rd Battalion (on attachment to the 1st Battalion), the Bedfordshire Regiment. Son of William and Emily Martha Perham, of 110, Mantle Street, Wellington. Born in the March Quarter of 1889 in Burlescombe. Died 10 March 1918 aged 29. Corporal Henry William Hemborough of the 2nd Battalion, the Devonshire Regiment. Son of William and Caroline Hemborough. Born in 1883 in Burlescombe. Died 1 July 1916 aged 33. Corporal William Webber of the 1st Battalion, the Somerset Light Infantry. 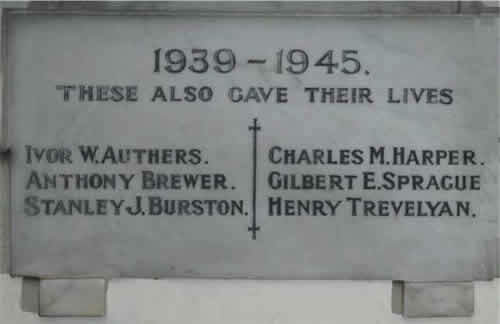 Son of Francis and Jessie Webber, of Westleigh, Burlescombe. Born in the September Quarter of 1898 in Burlescombe. Died 4 October 1917 aged 19. Private Charles William Alford of the 1st Battalion, the Duke of Cornwall's Light Infantry. Son of William and Clara Alford, of 2, Myrtle Row, Coldharbour, Uffculme. Born in 1893 in Burelscombe. Died 18 April 1917 aged 23. Private Edward Burston of the 1st Battalion, the Devonshire Regiment. 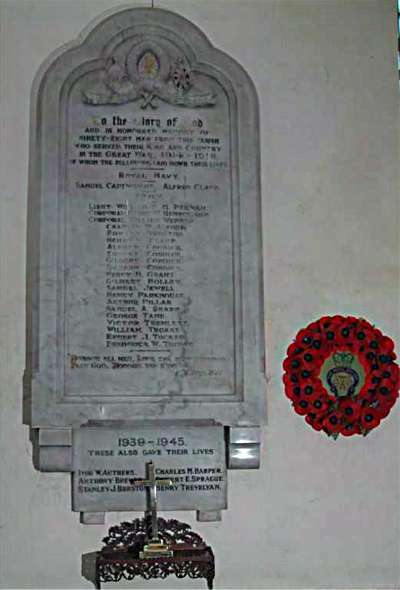 Son of Thomas and Emily Burston and husband of Lucy Saunders (formerly Burston) of 4, Church Green, Wellington, Somerset. Born in the December Quarter of 1884 in Burlescombe. Died 25 October 1914 aged 30. Private Henry William Clapp of the 1st Battalion, the Devonshire Regiment. Son of Henry Clapp, of Allen Cottage, Westleigh, Wellington and the late Mary Ann Clapp. Born in the June Quarter of 1893 in Burlescombe. Died 4 October 1917 aged 24. Alfred Condick is believed to have been born in Burlescome in 1885. Husband of Agnes (née Grant) who he married in 1908. His service record is not yet confirmed. Private Ernest Condick of the 2nd Battalion, the Welsh Fusiliers. Believed to be the son of Joseph and Ellen Condick and to have been born in Uffculme in 1888. Died 27 October 1914 aged 26. Private Gilbert Condick of the 8th Battalion, the Devonshire Regiment. Son of Joseph and Ellen Condick. Born in the March Quarter of 1892 in Holcombe Rogus. Died 4 September 1916 aged 24. Private Richard Condick of the 9th Battalion, the Devonshire Regiment. Son of Joseph and Ellen Condick and husband of Ida Tooze (formerly Condick) of Furlong Cottage, Westleigh, Burlescombe. Born in the September Quarter of 1883 in Burlescombe. Died 1 July 1916 aged 32. Private Percy H. Grant of the 1st Battalion, the Devonshire Regiment. Born in Burlescombe. Died 16 August 1917. Private Gilbert Holley of 274 Coy.,the Machine Gun Corps. Son of William John and Louisa Holley, of Westleigh. Born in the March Quarter of 1895 in Burlescombe. Died 13 May 1918 aged 23. Private Samuel Jewell of the 9th Battalion, the Devonshire Regiment. Son of William and Anna Jewell. Born in the June Quarter of 1895 in Burlescombe. Died 13 January 1916 aged 20. Private Edward Condick of the 2nd Battalion, the Dorsetshire Regiment - seconded from the Somerset Light Infantry.. Believed to be the son of Henry and Elizabeth Condick. Born in Burlescombe in the March Quarter of 1892. Died 22 April 1916 aged 24. Private Ivor William Authers of the 1st Bucks Battalion, the Oxford and Bucks Light Infantry. Son of Francis and Daisy Authers of Werescote, Somerset. Born in 1920. Died between 10 may 19140 and 21 June 1941 aged 21. Private Anthony Brewer of the Pioneer Corps. Son of William and Ann Brewer (née Bray) of Burlescombe. Born in Burlescombe in the June Quarter of 1921. Died 29 September 1943 aged 22. Marine Stanley Jack Burston of the Royal Marines, HMS Exeter. Son of William and Alice Burston (née Emery) of Burlescombe. Born in the December Quarter of 1919. Died 1 March 1942 aged 22. Commemorated on the Plymouth Naval Memorial. Private Charles Mark Harper of the 2nd Battalion, the Devonshire Regiment. Son of Mark and Bessie Harper. Born in Burlescombe in the September Quarter of 1906. Died 31 July 1943 aged 37. Able Seaman Thomas Henry Trevelyan of the Royal Navy, HMS Hartland. Son of Tom and Lucy Trevelyan (née Tooze) of Westleigh. Born in Burlescombe in the June Quarter of 1921. Died 8 November 1942 aged 21.